Todays Community TV Show with +Diane Richardson had more than a touch of sadness. Today we featured a short but emotional interview with +Sara-Jane Trebar from the Save Farm Terrace campaign. 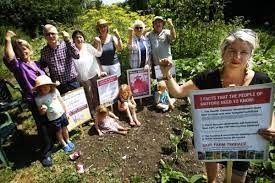 On Wednesday the final announcement came from the High Court that the application to sequest the allotments as part of the plans for the 'Health Campus' had been approved and that the campaigners had lost the decision. Thoughts of an appeal were quickly quelled by the legal representatives who stated that upon each subsequent appeal the case is weakened, so it was time to accept the decision. 4 years of campaigning now come to an end. 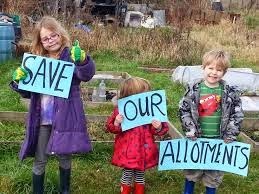 It seemed an impossible dream to save the allotments and yet the campaign team could almost taste victory and a landmark decision that would safeguard allotments around the country... but sadly it wasn't to be. Perhaps the legacy of this campaign will be to have lost the battle but won the war. This is a story of a David and Goliath. The council with access to the finances to fund a long and bitter legal fight, the inevitable backing of the government and probably the house of lords... and constant representation in the local newspaper disparaging the small group of people standing in the way of Watford's progress. But it is evidence too. It is evidence of how the will of those 'in power' can be wielded without due diligence to the concerns of the people. This need not have gone to court 4 times... this need not have cost the tax payer 100's of thousands of pounds. This need not have been a win / lose battle. This could have been a triumph for real democracy. A triumph for how people could work together to achieve outcomes that worked for all... but instead it has resulted in sadness and ego. This is no glorious victory for the council. This was a sad day where a 'sense of fairness' had long since left the building... The keys were handed back and the doors closed to the allotment holders on Thursday 3rd November.